I’ve said it before, and I’ll likely say it every time I review one of these. Whatever you call it, the sourcebook dedicated to creatures and monsters is the most important book in any roleplaying game, after your Core Rules. 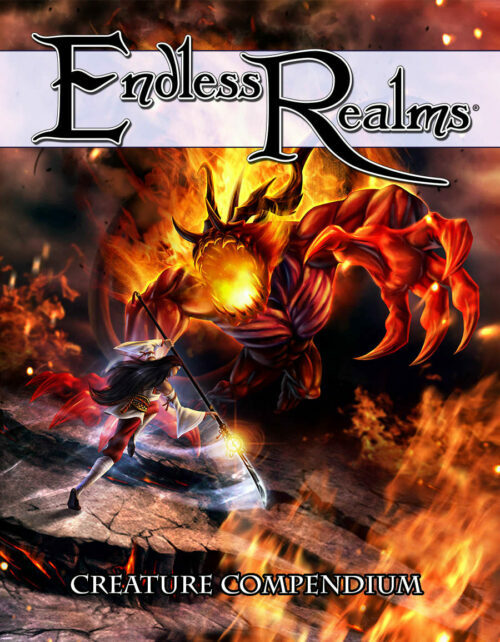 The Endless Realms Core Rulebook set the bar for their sophomore book extremely high, let me tell you, which made this very hard to review. I’m going to start with the “negatives” just to get them out of the way. There were a few noticeable editing hiccups, but honestly, I’ve seen higher profile games with almost as issues there. It happens. Anything else “negative” I could say really comes down to comparing this book to the Core Rulebook, which is varying degrees of unfair. One thing that I loved about the Core Book was the inclusion of phonological notations under all the races (even Human), I would have really liked to see the same done for this book. When you’re dealing with a bunch of made-up names, it’s nice to have some sort of reference for pronunciation. Does it suffer for not having that? Goodness no, but having done it before I was hoping for it again. The only other thing I missed, and this is a bit more legitimate I think, is the Core Book did a much better job at cross-referencing page numbers when needed. For example, the entries for both Bocan and Brownies reference each other, but not the page numbers, and that can be really annoying. Now on to the good things, because they very much outweigh anything bad I could ever say. First off, the art is gorgeous. Using a single artist for a project like this can be risky, but does it ever pay off. Jennifer Elliott’s work is nothing less than stellar throughout both books. There are creatures here ranging from semi-normal to completely weird and outrageous, and they all look astonishing. The book is organized mostly alphabetically. There are some creatures, like Dragons and Corrupt Spirits, that have multiple entries and require a bit more page-space so have their own subsections. Similarly, both the Aethir and Koros races, the progenitors of the Kalamir adventurer race, have subsections. Just like the chapters in the Core Book, these subsections are visually distinct enough to easily recognize where you are in the book. Not every creature in this volume are creatures you would automatically fight against. Some are actually good or helpful creatures that players may encounter in more of an NPC capacity, and that’s a nice way to expand the world being built in this game. As well, a sizable section of Lore included for every entry. Some things, like the Aethir Qorbani have incredibly strange and tragic origins. Others, give a wink and a nod to real-world myths from around the globe. I think my favourite is the subtle Catfish reference to the Japanese Namazu legend. I was surprised to see an entry for something a generally mundane as a Catfish, then saw that reference and smiled. Although there are numerous parallels to creatures that are also in other games, they are still incredibly distinct in Endless Realms. Dragons, for example, basically have to show up in any fantasy setting. If they don’t, players will inevitably just do it themselves. As such, Lunar Games’ have created an origin to Dragons unlike anything else I can remember having encountered. As I mentioned, there is an entire subsection of different dragons, but how they came into existence is the same, and it just fits perfectly. Did I mention the art is amazing? Wouldn’t it be great if you could use it in your game? There’s a 30-page printable pawn collection on DriveThruRPG.com covering the majority of the creatures you’ll find in the Creature Compendium book. (For the record, I say “majority” without having gone page-by-page comparing what is or isn’t included. It may actually be everything.) Because they aren’t a tri-fold style, you’ll want bases for them, and you should spend some coin to print them on the highest quality cardstock you can manage. Even if the Creature Compendium isn’t 100% on par with the Core Rulebook, it remains well above similar volumes from other games. Unless your job is to be nit-picky, you’re going to love this. I’m excited to see their next project, Tome of Spirits, when it hits Kickstarter in about a month. Until then, you can find Lunar Games and Endless Realms online at www.endlessrealms.ca or on Facebook atfacebook.com/EndlessRealmsRPG.